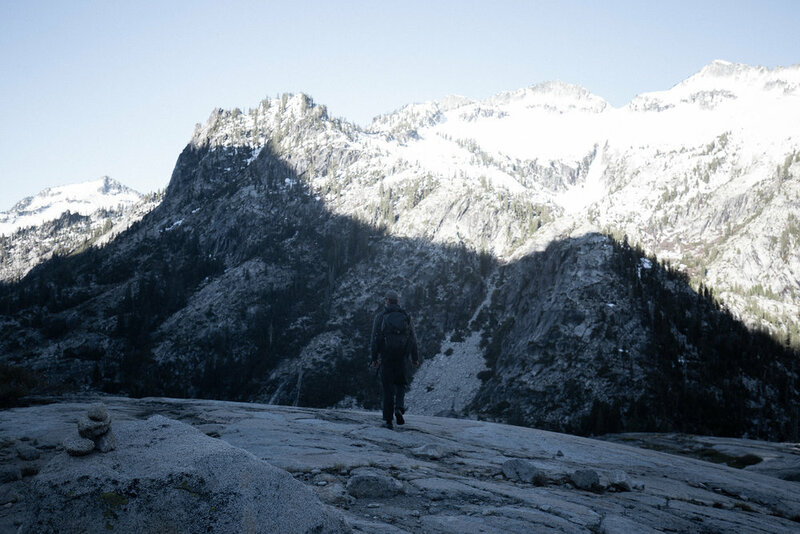 Backpacking in the Trinity Alps. Have you ever wanted to start backpacking, but didn't know where to start? Didn't know what you should buy, what does what, what you actually NEED, what you don't need, etc.? Well, we've all been there at some point or another, and there's one or two ways to start; you can either spend countless hours online researching about things you have no clue about, or you can ask friends about what they use. But, at the end of the day, everyone's setup is completely different because everyone's needs, preferences and budget ultimately tell their story by what they can carry with them. At the same time, this is what is so fun about backpacking, experimenting with gear, finding out what works for you, really living that type 2 fun. I have been backpacking for a couple years now, really focusing heavily this year into understanding my gear, figuring out what I absolutely NEED, counting ounces, finding ways to do things faster & lighter, all while being comfortable. I've logged alot of miles in the backcountry experimenting with gear and I am quite positive that I have found a setup that suits me, but, the thing is to always stay open minded, ask questions, and try new things because you never know unless you try. You may think your setup is perfect until you meet someone who has something you may be able to incorporate or replace into your setup that will be a game changer. Sometimes it's hard to part with a system you think is "perfect," and try something else, but that goes the same with life, always be willing and open to new things. Now, to the FUN part, here's some imagery. Sunset from my 5 star hotel. Camping @ El Lake in the Trinity Alps. Cameron diving into the Canyon Creek lakes. Tent views @ Alpine Lake. It's TRULY AMAZING where our feet can take us yeah? Sawtooth's reflecting in the Boulder Lake Basin. Summer winter storm in the Trinity Alps. Early morning views from camp. 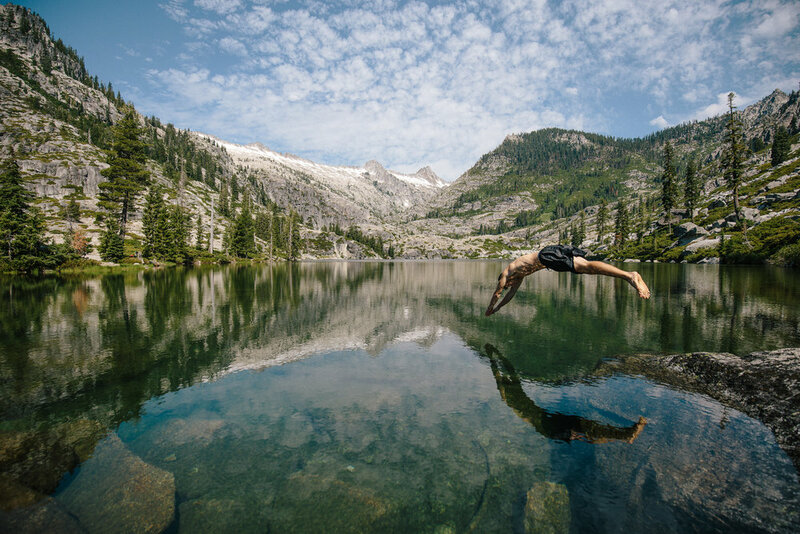 Nothing more refreshing than jumping into an alpine lake after a long trek. I think the biggest reason we backpack is for the views, for the experience, and to be fully immersed and in tune with our surroundings, listening to your heartbeat while your feet propel you forward. If these don't intrigue you to get out into the backcountry, well, you should just take my word for it. :) I could sit here and post photos all day of some of my favorite places, but that isn't the intention, if you want to see more of my work, head over to my Instagram. Now, where were we... Oh yeah. As I can imagine, you want to start backpacking because of a couple of things; all your friends do it, you want to impress a guy/girl, you want to immerse yourself into nature, you want solitude, you want to challenge yourself, or, you just need a place to recharge,well let me tell you, you've picked the right hobby. Now starting this can be scary, spending time in the outdoors without cell reception, miles away from civilization is enough for anyone to think twice about it. But let me tell you, once you get over spending your first night, it becomes addicting, and something you begin to crave. Probably one of the most important, researching where you want to go. How many miles is it there and back, how much elevation are you gaining/losing, what's the terrain like, weather, camping spots, etc. This is super important, always, always research before you go out & always plan accordingly, and for the unexpected, because, let me tell you, things DO HAPPEN out there and if you're not prepared, you can really find yourself in a pickle you don't want to be in. Now, if you're new to backpacking, you may or may not want to go out for your first time alone, I know I didn't. Hire a guide, tag along with a friend who has been doing it for awhile so at least this way your first time can be enjoyable and memorable, this will likely increase your chances of going out again. 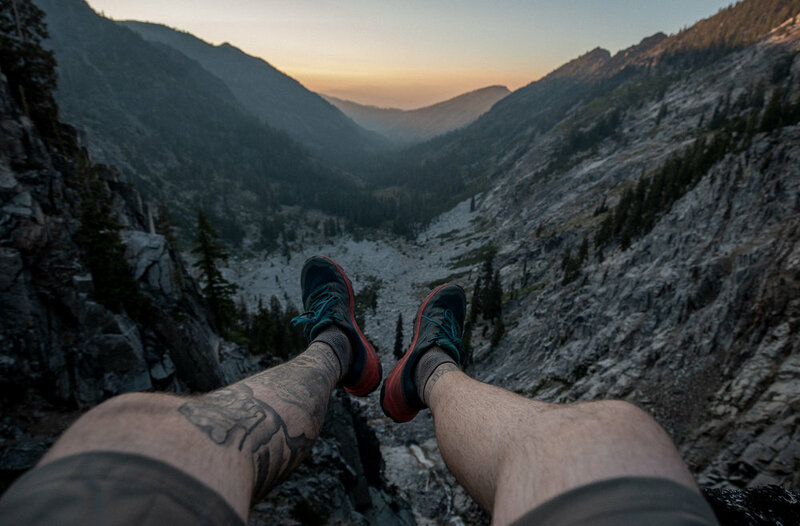 You can also slowly progress yourself into it as well, start out by day hiking, then progress into sunrise/sunset hiking so you can get used to hiking in different light situations, camp in campsites so you can get used to sleeping on the ground or in a hammock, etc. These are all things you can do to be proactive and help you truly enjoy your experience. This is the most important, in my humble opinion. Always, ALWAYS tell someone, a handful of people where you are going, how long you will be gone, who you're going with, when you'll be back so that incase nobody hears from you in that amount of time, someone knows where to tell someone where you were headed incase you need to be rescued. This sounds cliche', but its important. Bring extra socks, underwear, jackets, etc, because you would rather have it and not need it than need it and not have it. I got caught in a snow storm in June and for some odd reason I brought 3 pairs of socks that trip and ended up using all 3. As beautiful as it was, it was also wet, and when you're wet, you can become uncomfortable very quickly. 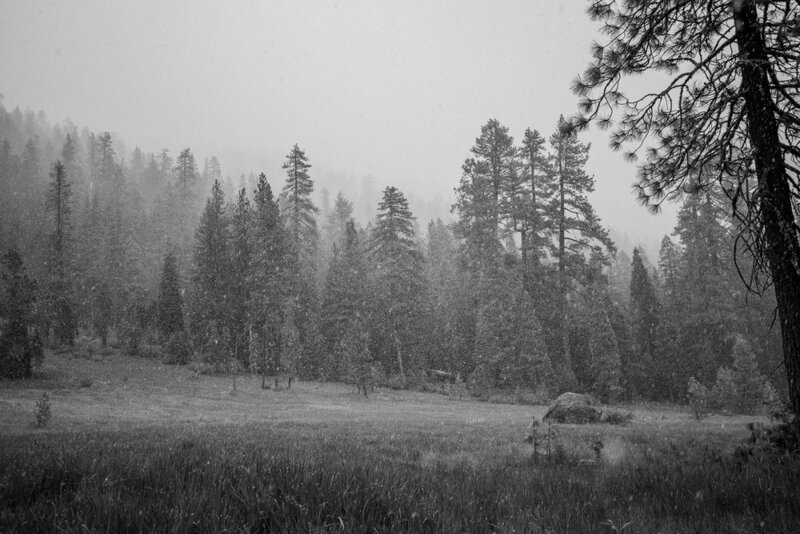 Unexpected snowstorm in June in the Trinity Alps. Okay, I lied, this is the most important, well, it ties with telling someone where you are going. Stay on established trails and durable surfaces. Pack it in, pack it out (do not leave any trash int the backcountry). Find out more about the Leave No Trace here. Now, the fun part, let's TALK GEAR! Below is my current setup,which I will break down piece by piece, price, weight, use, etc. Mind you, my setup won't be ideal for everyone, please take this into consideration before you start forking out money to purchase items. But, before we jump into this, I solely put the prices in so you have an idea of what it costs for some of the ultralight items that I use to keep my pack weighing as little as possible. Obviously this may not be suitable for everyone as we all have different budgets, but I just wanted to share what you can expect if you wanted to join the #sub20lb club. I chose this pack because I consider myself a minimalist when it comes to my gear, only bringing what I absolutely NEED. Made with ultra-durable, 100% waterproof Dyneema® Composite Fabrics (formerly Cuben Fiber), this bag has seen some crazy conditions thus far and held up against it all! The roll top creates a barrier to where no water can seep in, a Y-strap top to ensure everything is secure and, it's quite stylish if I must add. You can even completely customize it by having your friends sign/draw on your bag! Click here to shop Hyperlite packs. I opt for the 2 person ultralight version of this tent for many reasons. One is I like to have excess space for myself and if I want to bring my gear inside I can do so, in a pinch it can fit 2 people. I also love having 2 vestibules and I am not a huge fan of a front entry point. This is a backpackers dream, in my opinion. Click here to shop Nemo tents. I wanted to choose something that wasn't super name brand, and I came across this company and am absolutely in love with their products! 900 Fill down packs this bag down super small and you can't even tell it's in your pack. Warm, yet comfortable, and stylish. Click here to shop ZPacks. Watching the sunset from my tent. If you're a minimalist as I am, or aspire to be one, this is a MUST have. Perfect for 1-2 people and can boil up to 2 cups of water, perfect for any dehydrated meal, oatmeal, ramen, coffee, etc. This is my go to! I also bring 3 lighters with me because you never know when one won't work. Click here to shop JetBoil. If you're looking for lightweight, yet sturdy poles, these are what you want, don't let the price steer you away, every piece of gear you buy is an investment, and if you choose to buy "cheap," you may regret it and be in a situation you wouldn't be in otherwise. Click here to shop Black Diamond poles. Now, for the final few items, there aren't any photos, so I apologize, but I will list the specs as I have above. 4.99$ a canister, check in your local sports store for supplies. For all you nerds out there like myself, my base weight with the items above is 127 oz, or 8.1 lbs (without the poles strapped to my bag)!! Now, let's talk about another crucial part of backpacking; clothing. 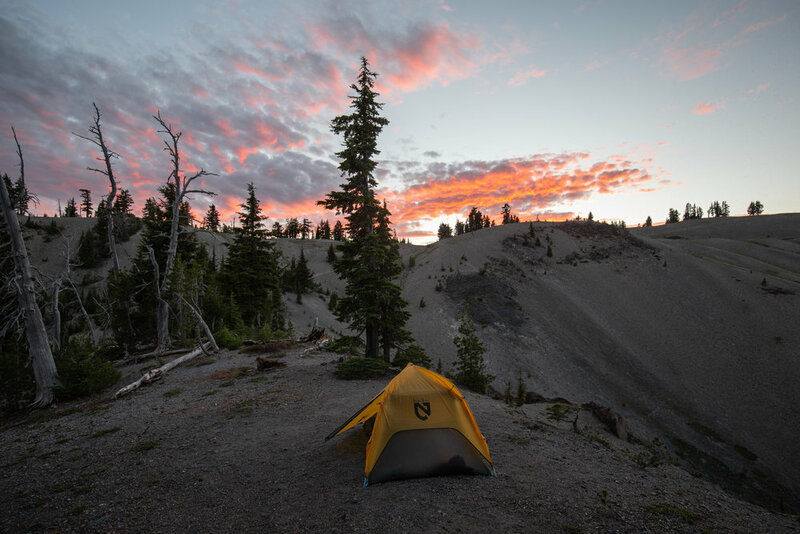 I think we can all agree that comfort is super important when you're in the backcountry, you want to enjoy yourself as much as possible, and the best way is to be outfitted correctly, Below are my go-to's to stay comfortable in any type of environment. Staying dry and warm at Mossbrae falls. These are my new go-to's for backpacking and hiking, these held up extremely well on really loose gravel and boulders, traction is great, and best of all, my feet didn't hurt like alot of shoes I've bought and worn without "breaking them in." Lightweight and durable. This jacket goes everywhere with me, caves, mountains, waterfalls, alpine lakes, etc. Sizing is spot on, I'm 5'9" and wear a medium. I love how it is reversible, the colors really pop (I have the red one). Great for brisk mornings in the mountains, or nights around the campfire when temperatures start to drop. Packs down small, which is important for me to be able to organize it into my backpacking bag! Warm, not hot, which is important. & most of all, it's comfortable, I get alot of compliments when I wear it and people always ask where I got it! This is my go to for early morning hikes or sitting around the campfire when it's not too hot, not too cold or when I don't want to wear a mid-layer. Fits snug in all the right places, I only wish there was a pocket for my phone for when I am using this as the outer layer. Minus that, I absolutely love this lightweight jacket. Packs down super small which is convenient to fit into my backpacking bag! Ridgeline views in the early morning. Now,let's talk about a couple other things that are just as important, the little things. These are ALL things that are necessary as well to have an enjoyable experience in the backcountry. But.... Do you think I really forgot about food and snacks? Pshh, not me, however I tend to eat less when I'm in the mountains, you DO need fuel. I'm a simple guy, it doesn't take much for me to be happy, especially when it comes to food, hence why my list is quite short. The backcountry is a place where we go to reflect, progress, ponder, get away from everyday life, it's a sacred place. I do not claim to be an expert, so please do not take this as professional advice, because it's not. I'm just an average guy who has an insatiable passion for the outdoors and hopes to inspire you to have that same feeling whenever you embark on an adventure. All of my advice above is purely opinion, as it is what works for me, it may not work for you. There is no "one size fits all" with backpacking. There is alot I don't know as well, and am always learning more about safety, risk, and preventative measures everytime I step into the backcountry. There's a million things out there I am sure I could really use, but for now, this is my current setup! I thoroughly hope you enjoyed reading this, and I hope it helped guide you in the right direction if you're just starting out, or if you've been doing it for awhile! Questions are always welcome! We do this for the views.